SÄBU Modular Construction. Individual. Flexible. Durable. SÄBU Modular Construction enables individuality and modern architecture when planning and designing buildings made of individual room modules. 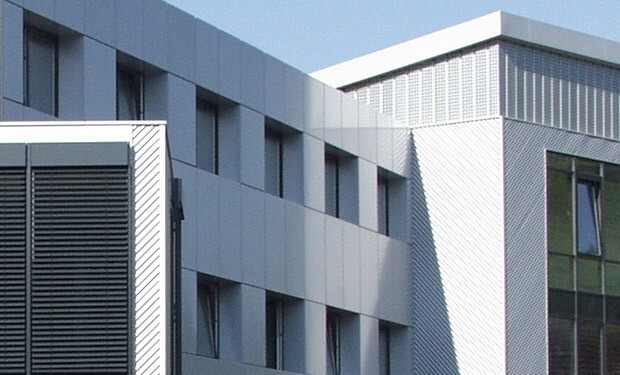 Modular construction has the advantage that this buildings offer a high variability. The function, design and economy of the modular buildings can be adjusted to the actual situation, can quickly be changed and the units can be enlarged or heightened without problems. Planning and Construction for Industry, Trade and Municipalities. SÄBU Modular Construction can quickly answer to the requirements of industry, trade and municipalities. Kindergartens, schools, medical facilities, universities as well as industrial buildings are erected ready to use and at a reasonable rate - SÄBU offers all from one hand, from planning to assembly. Spring, Summer, Autumn or Winter? Independent from the Weather. SÄBU modular buildings are erected in a fraction of time that is required for conventional massive construction. Due to the prefabrication at our factory the modules are produced independently from the weather and are assembled on site in only a few days by our qualified staff. Certain Planning by Fixed Price Guarantee. Due to the guaranteed fixed price you can be safe from bad surprises when financing your building project. The short construction period reduces the financing costs to a minimum. You can quickly use the modular building and earlier achieve earnings as hirer. SÄBU modular buildings meet all demands of modern buildings.